A road blockade constructed by Areng Valley activists to prevent developers and equipment from entering the area. 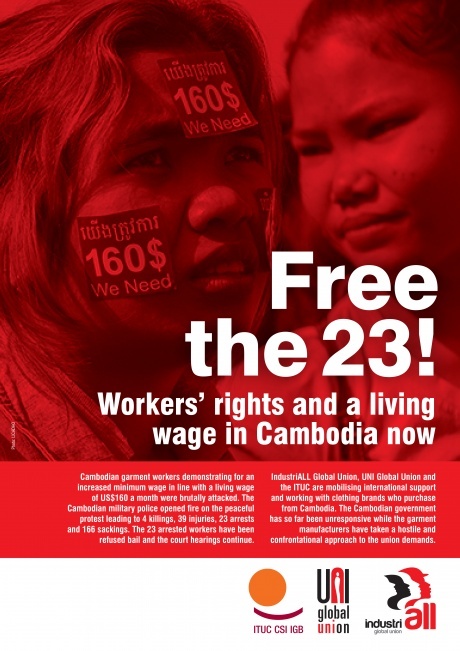 Global unions are mobilizing workers around the world to protest at Cambodian embassies on Monday 10 February to demand the release of 23 activists seized during demonstrations in the Cambodian capital Phnom Penh in January. The detainees, which include trade union activists and garment workers, were incarcerated after peaceful rallies on 2 and 3 of January were met with brutal force by Cambodian police, which opened fire on demonstrators leaving four people dead and 39 injured. Unions are being asked to demonstrate outside Cambodian embassies and present a letter to the ambassador condemning the violence against the garment workers and demanding the release of the 23 detainees. The letter also calls on the government to respect the right to freedom of association. It follows an open letter to the Cambodian Prime Minister, Hun Sen, from IndustriALL, UNI and ITUC together with 30 of the world’s major clothing brands, including Walmart, Nike and H&M, demanding a thorough investigation into the perpetrators of the killings and appealing to the government to honour its commitment to establish a fair and inclusive process for determining a new minimum wage. The Cambodian government has so far been unresponsive while the garment manufacturers have taken a confrontational approach to union demands. Download this model letter to present to the Cambodian Ambassador. Download and print the campaign poster, take it to your protest, and send us the pictures. Sustainable industry is an oxymoron. I don’t believe there is an ethical approach to consumption- the global industrial complex depends upon the exploitation of oppressed peoples around the world. H&M’s claim to be a “positive impact” and a welcomed “alternative” is unfounded. 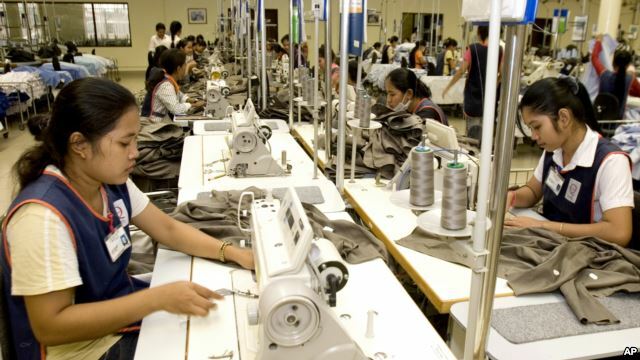 While the garment industry perhaps offers more reliable employment, these factories bear no semblance to ideal “democratic” workplaces. If H&M truly cares about workers rights, why don’t they address the striking workers demands? The problem goes beyond the issue of factory standards. The reason that so many seek employment in these factories is they often have no other choice. In Cambodia, between land grabs, displacement by environmental destruction (damming rivers for hydro-electric power), and the serious deficit of accessible education, many are forced to live in the shadows of cities to either toil through factory life or become prostitutes. Consumerism is an insatiable machine fueled by full-throttle resource extraction. Although H&M is the worlds leading organic cotton buyer, organic cotton only amounts to eight percent of H&M’s total cotton use. Green-washed products and fair trade deals are empty corporate promises. My politics are hard-line anti-capitalist. There is no solution for this system- buying what we think are ‘socially-conscious clothes’ will not stop the ecological crisis we face. Paying the workers higher wages only further indentures their lives to industrial servitude. Put yourself in the place of a garment worker- would you want to spend your life toiling for 9-plus hours a day with no way to move forward or work on things you actually care about? Their lives are not their own. This is the true cost of cheap fashion.